The first chapter of the underground mine of the future is the replacing of mobile equipment diesel engines with exhaust-free battery electric propulsion systems. To this end, MacLean has completed close to 200 kilometres of ramp run trials on its BT3 battery electric boom truck, the purpose of which was to address the question of range anxiety on high-tramming units in underground mines. These ramp trials are allowing for the validation of performance modeling assumptions with actual performance data from real world conditions of an underground mine. An EV material haulage unit like a boom truck needs to be able to carry as much as 35,000 pounds of cargo up 15% and higher grades across rough road beds, so the question of how long /how far it will last underground is always going to be one of the first asked by mining companies evaluating the total cost of ownership for EV fleets. MacLean has learned two key things from its ramp run trials conducted to date: 1) you need to engineer the mining cycle, not just the battery cycle; and, 2) the user experience of battery electric vehicle technology remains as important as the technology itself – UX meets BEV. Connecting the battery cycle with the mining cycle rests on planning for opportunity charging – taking advantage of the duty cycle flexibility that onboard charging provides to plug into the mine’s existing electrical grid during loading or unloading or at lunch break. With this type of planned, quick top-up (for example 20 minutes of recharging on every second run during the duty cycle), you can maintain enough state of charge to achieve continuous EV mobile fleet operation across a full shift. The grade of the ramp, the weight of the load, and the condition of the roadbed all impact the opportunity charging requirements of a BEV material haulage duty cycle, but not to the extent that opportunity charging, well thought out, can’t respond to. And in this case, range anxiety essentially disappears. The same issue of user experience holds true for harnessing the full potential of regenerative braking on battery electric underground mining vehicles. The feel of brake holdback going down-ramp is new for operators, so the full potential of down-ramp re-generative braking, especially with a full load (up to 35% of the up-ramp energy use restored), isn’t always maximized. Finally, the condition of the roadbed is an important factor in maximizing regenerative capability, so the grader will be an integral part of underground mines’ EV fleets. Operators in the diesel engine context can fill up their diesel tanks at the beginning of a shift and not think about it again. 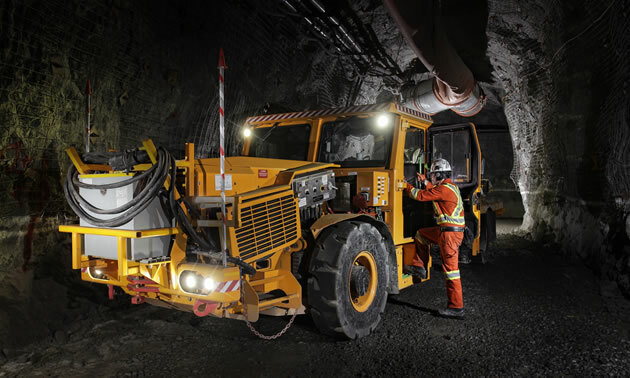 In a battery electric mine it comes down to the renewed importance of good training - switching out diesel fuel for battery electricity on mobile equipment is as much of a user experience exercise as it is an engineering exercise.